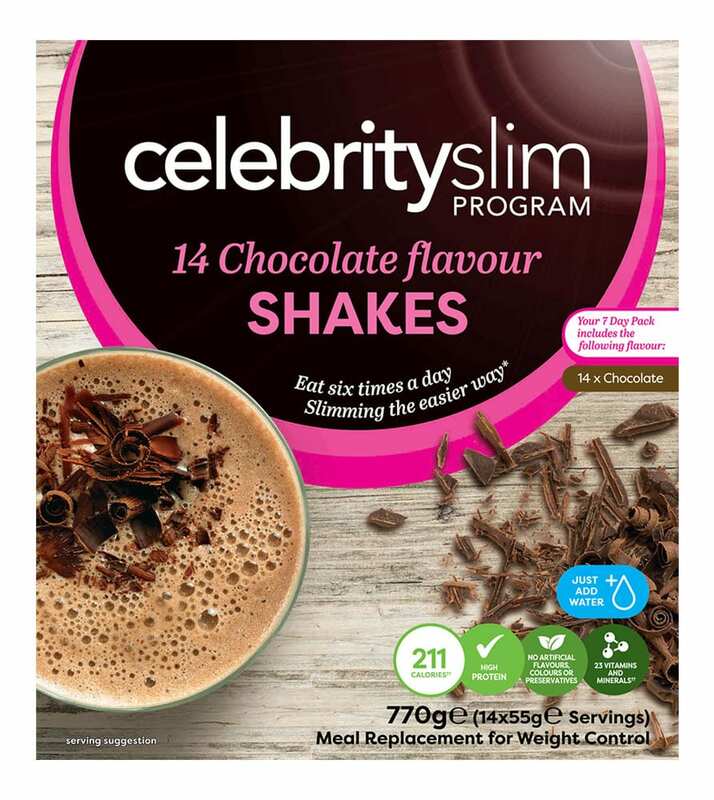 14 delicious Chocolate-flavoured meal replacement shakes. Skim Milk Powder, Fructose, Calcium Caseinate (Milk), Whey Protein Concentrate (Milk, Soya), Vegetable Oils (Milk) (Sunflower Oil, Refined Palm Oil), Cocoa Powder (5%), Soya Protein Isolate, Glucose Syrup Solids (Wheat Gluten), Minerals (Dairy Calcium (Milk), Magnesium Oxide, Ferric Pyrophosphate, Zinc Sulphate, Manganese Sulphate, Copper Sulphate, Potassium Iodide, Sodium Molybdate, Chromium Chloride, Sodium Selenite), Vitamins (A, Thiamin, Riboflavin, B6, B12, C, D ,E, K, Folate, Niacin, Pantothenic Acid, Biotin), Inulin, Thickener (E412), Chocolate Flavour (0.3%), Green Tea Extract, Emulsifiers (Lecithin, E471, E472c), Anti Caking Agent (E551), Maize. Allergens listed in Bold. Suitable for Vegetarians. 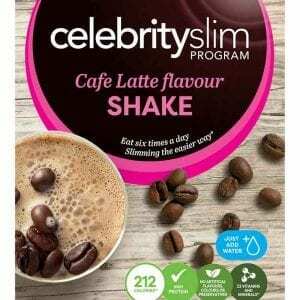 Disclaimer: * Healthy and effective weight loss when substituting two daily meals with meal replacement products from the Celebrity Slim energy restricted diet and exercise programme. Results may vary by individual.